Space: the final frontier. Wouldn’t it be cool to go there – really go there – to the far reaches of our galaxy, and beyond to other galaxies? That may not be humanly possible (yet), but we can explore the far reaches of space from here, and space reveals itself from the constant stream of signals it sends to Earth, via light and radio waves and in the infrared spectrum. The radio waves are electromagnetic remnants of the makings of everything since the Big Bang and hold clues to how it all happened, how it is happening, how it is likely to happen and whether or not there may be other kinds of life far beyond where we currently can extend our reach. The discovery by astronomers in recent years of nearly 4,000 planets beyond our solar system – exoplanets – gives impetus to searching innovatively for the conditions that give rise to living organisms, such as liquid water, organic compounds and particular molecules. To seek answers to the really big questions – how life originated on Earth and how common (or uncommon) it might be in the universe, the University of Virginia has kick-started a new “Cosmic Origins” initiative, which brings to bear the tools of chemistry, astronomy and biology for understanding how life might extend beyond our solar system. The program is led by chemistry and astronomy professor Eric Herbst, who long ago developed an interest in the chemistry of space – which is essentially the chemistry of everything, including the makings of Earth. 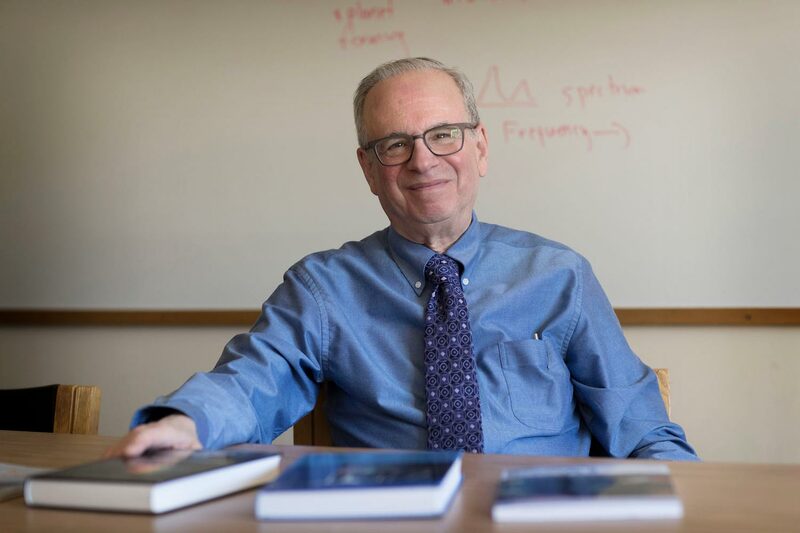 So much so that Herbst has dedicated much of his career to the still somewhat burgeoning sub-discipline of astrochemistry, what he calls a “fast-moving field,” and has worked closely with astronomers who use radio telescopes to glean truths from the mysteries of how everything came together. Under the Cosmic Origins program, which is funded by a new $1 million seed grant from UVA’s Office of the Executive Vice President and Provost, Herbst and his management team are pulling together a dedicated cross-disciplinary effort to dig deep into space chemistry, which also will include support for postdoctoral fellows in astrochemistry and related fields. The Cosmic Origins group is made up of members of UVA’s chemistry and astronomy departments, working with astronomers at the National Science Foundation’s National Radio Astronomy Observatory, based in Charlottesville. The program provides access to data from radio telescopes in Green Bank, West Virginia, and the premier Atacama Large Millimeter/submillimeter Array in Chile. Other Cosmic Origins partners include Germany’s Max Planck Institute for Extraterrestrial Physics and the Chalmers University of Technology in Sweden, which includes Jonathan Tan, a faculty member with a part-time appointment at UVA. The Cosmic Origins initiative is designed to leverage these partnerships for seeking additional funding from federal research agencies to enhance research capabilities. The first galaxies, during their forming stages, were chemically simple – primarily made up of hydrogen and helium, elements made in the Big Bang during the first three minutes of the universe’s existence. As massive stars formed, more molecule types formed, creating heavier and more complex elements by nuclear fusion, ultimately making an expansive universe of countless galaxies like our Milky Way. Among the chemicals formed, including oxygen, the path opened for life, at least on one planet. The Cosmic Origins group is focusing on interstellar clouds, which collapse and form into planets. These regions of space, considered solar systems in the making, are active breeding grounds for a range of molecules, including exotics not found on Earth. The group is using laboratory experiments, theoretical studies and radio-telescope observations to expand understanding of the processes that build the very molecules upon which life ultimately is built. 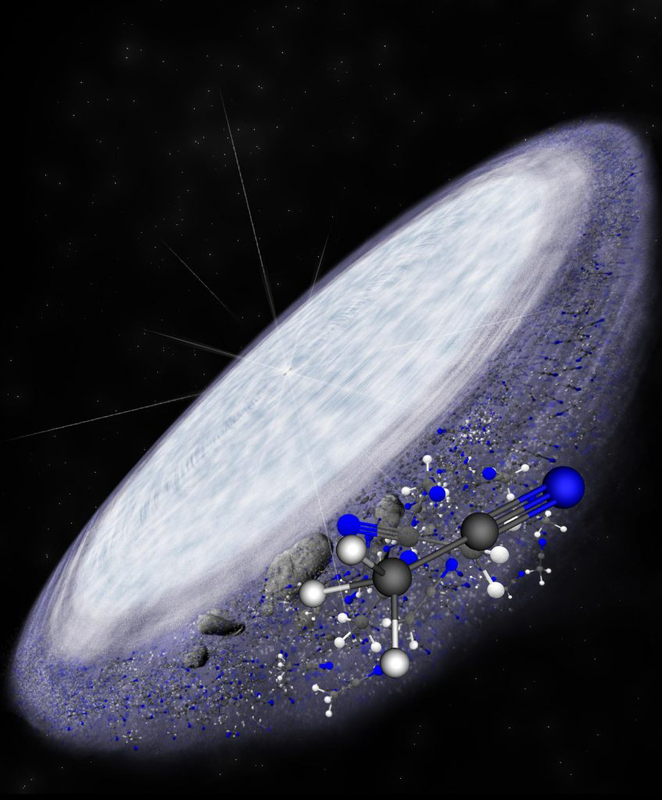 As an example, six years ago astronomers at UVA and the National Radio Astronomy Observatory discovered in radio astronomy data the molecule cyanomethanimine, a precursor for RNA – a key building block for the development of life on Earth. This could indicate that life of some form, simple or otherwise, could exist beyond our solar system. The search is on for other molecules that are foundational for the development of living matter.